The truth is measured by the weight of your gold..."
It was at that moment when I was about to listen to the music when the cyanicCD glowed like a jewel. So I gazed at it and took this picture. 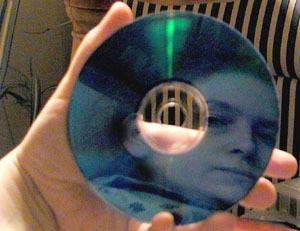 Originally the bluedisc reflects (burned into its organic dye) the songs of an exceptional Canadian artist LoreenaMcKennit and the author of my quote. But tonight iteven mirrored my image for the pleasure of TMP.